Note: Today’s utility industry is in upheaval. All of the assumptions the business has run on have been turned on their heads. This post is the third in a three-part series looking at how analytics are helping utilities navigate this challenging landscape and find new opportunities for improvements in operations, customer satisfaction and revenue. 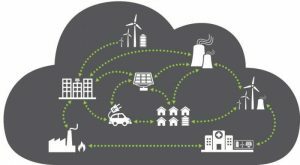 With the advent of energy prosumers, two-way energy flows, microgrids, EV charging infrastructures and intelligent IoT devices, the traditional boundaries between grid and customer are becoming blurred. Fortunately, utilities have an opportunity to embrace technology and innovative business models that will help them delight customers, improve reliability, and unlock new revenue streams. In an era where the bytes are becoming as valuable as the electrons, this will require a robust data analytics platform that delivers value today -- and can evolve to future demands. This movement away from the traditional utility structure is creating a dire need for new ways of doing business. Utilities need to re-examine how the organization is staffed, business processes, and, of course, the systems and data required to flourish in this new environment. The figure below is a good representation of how different this new world will look compared to how a utility operated just a few years ago. The Energy Cloud. Source: Navigant. Rooftop, community and grid-scale solar all represent great potential that is being realized every day, especially in the sun belt of the southern and western United States. Along with benefits comes some challenges, such as coordinating the ramping up and down of solar power with the variances in sunlight, and in the transition off of solar every afternoon, even in the best of conditions (known as the “duck curve” in many circles). Predictive analytics are one key to cracking this reliability challenge. Utilities can incorporate different data sets, including smart meter interval data to predict loads and weather data to model conditions. Pushing these analytics to the grid edge (in this case on-premise at solar facilities) will make more real-time operations and reliability possible, while still supporting model management and improvement over time at the enterprise level. Much like solar energy, EVs aren’t only coming, they're here. With analysts projecting more than 10 million EVs on roads by 2026, it's quickly becoming an operating reality for utility leaders. The discussions about EVs have evolved from grid overload concerns to capitalizing on this rare growth opportunity for electric utilities. Analytics will help utilities mitigate grid disasters and realize new revenue streams. Analytics-based applications like smart charging, vehicle-to-grid storage, and a variety of fleet and mobility programs will position the utility squarely in the middle of this new energy and transportation dynamic. Microgrids – localized sources of load and electricity that can function autonomously or on the grid – are starting to appear on the utility landscape. Sometimes these are owned and operated by third parties; in other cases, utilities themselves own and operate these facilities. As a microgrid site often includes multiple generation sources, storage, controls and monitoring, coordination and predictive operation of these assets will ensure system reliability. This is another case where driving analytics to the edge – the microgrid site, in this case – will be critical for real-time operations. These are all BIG shifts for utilities; the traditional roles of customer and grid operations must change. Every time a rooftop solar installation pops up or a new EV is parked in a customer’s driveway, then the relationship between the utility and the customer must change. These new assets owned by the customer will have impacts on the grid, not to mention the changes to the grid itself. The common denominator across all of these new assets and use cases is that they're all part of a digital grid, generating massive amounts of data that will need to be understood for all of this to work. The changes in a utility’s customer and grid operations will fundamentally change how a utility functions, internally and in society. To learn more, download this white paper: Analytics and the Modern Energy Supplier. Yes, it is true traditional boundaries between grid and customer are becoming blurred. Utilities need a platform capable of supporting this new energy world.